Since they’re on tour right now (see dates below), their German record label Wanda Records decided to release this great looking black & red 7″ vinyl. “Living In Sin” offers us a perfect mix of 70s glam rock and 60s power pop, killer guitars and catchy vocals, and “Rubbish” displays a more punk rock’n’roll side of the band, CHUCK BERRY guitars meets LITTLE RICHARD piano with the energy of The DICTATORS! 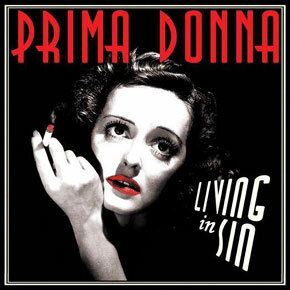 I’ve never been disappointed with PRIMA DONNA so far, today I’ve heard their version of the DOGS “I’m Just Losing That Girl“, and I really hope this one will be released on vinyl too!.. Until that, there’s only 300 copies of this record, so be fast!/Laurent C.
Modern Kicks “Just For Kicks” Video Premiere!